On Tuesday the 23rd of November 2010 I was sent a copy of a report into Cambridge City Council’s Protocol on Filming Committee meetings which has been produced by the council’s Independent Complaints Investigator Corinne Hibbert. The report was the outcome of an investigation which had been launched following a complaint concerning the filming of the North Area Committee on the 30th of September 2010. I had filmed that meeting with permission from the council and in compliance with their filming protocol. The report includes the terms of reference for the investigation; it appears the investigator was asked to review the council’s filming protocol in light of the complaint that had been made. Asking an unelected unaccountable individual to review something devised by a committee of councillors and approved by the full council just a couple of months previously appears very odd to me. I think it would have made more sense to ask the investigator simply to investigate the complaint. Perhaps as a result of the what the council asked for the report largely consists of the investigator’s personal views on filming meetings. I expected a rigorous setting out of the facts, judgements on any contentious issues, followed by any recommendations based on the investigation’s findings. The complaint is that the person was not made aware the filming was being done by a third party and therefore that person had not given informed consent to be filmed and to have voice, name etc. published on the internet. Without knowing the substance of the complaint it would be very difficult to make any sense of the report. Cllr Blair is probably correct to point out that members and the public are not aware of the potential ‘end use’ and are not giving informed consent. The investigation appears to have been conducted in a lazy manner as not all relevant information has been considered. There is little sign of any real investigation going on, there is no sign of efforts being made to really establish the facts such as what signage was present at the meeting in question. For example it appears video from just one section of the meeting has been considered, despite more, including the opening, being available on YouTube, and evidently minutes from other area committees have not been reviewed to establish the council’s practice on naming public speakers. Councillors involved in devising the filming protocol appear not to have been consulted; and the minutes of their deliberations are not referred to. I was not contacted during the investigation, and there is no evidence that the chair of the North Area Committee, or Committee officers were asked for their input either. The report also contains a number of inaccuracies and appears to have been written by someone with very little, if any, awareness and understanding of technology or the internet. In addition there are more minor problems such as not highlighting the fact the minutes of the North Area Committee used were in draft form and had not yet been approved. The report twice mis-quotes the title of an article I published as being: “East Chesterton Residents Terrorised By Thugs”, rather than: “East Chesterton Residents Terrorised by Thuggish Parents”, this is potentially material to arguments and recommendations made by the investigator due to the fact her report contains an allegation of sensationalism against me. Having viewed the ‘East Chesterton Residents Terrorised By Thugs’ blog it is clear that Mr A is as much interested in sensationalism as he is in transparency. The September North Area Committee dealt with a number of important issues, none of which are reported by Mr A save for the, tabloid headlined, Evergreens Close issue. As this casts doubt in my mind as to motive, I see no reason why an applicant should not be asked to explain their interest in a little more detail. I have pointed out the factual inaccuracy in the way the report has quoted my headline. It is also factually incorrect to say I did not cover any other issues at the North Area Committee. In addition to police priority setting I also reported on my public statement on the use of Anti-Social Behaviour legislation against those speeding or driving carelessly and published a video of that section of the meeting. I also published a video of my public question on the tree protocol and Alexandra Gardens Trees, the description of that video contains a summary of what was said and I have also published that video, along with commentary on my website. I don’t accept the premise that sensationalism is a bad thing; would the council want to ban those reporting for the tabloid press for example, but allow more heavyweight publications in? I think that’s a very dangerous road to go down. I think that enabling more people to find out about what the council is up to is a good thing. The fact is that if I had buried this important story deep within a long article it may have reached a smaller audience. How can an article which discusses the possibility of a traffic regulation order ever be considered sensationalist? I think my record for covering, in detail, subjects many would consider very dull speaks for itsself. I have written about the setting of police priorities in North Cambridge for a number of years. I think this particular instance, where emotive testimony from members of the public persuaded councillors to set a priority, was worthy of reporting. The story was also reported by the Cambridge News though of course given their space restrictions not in as much detail. I would note that had there not been a complaint to respond to I may have been able to spend more time covering other aspects of the meeting. The complaints investigator might not have been aware that many of the other agenda items, such as Akeman Street Planting were being debated for the second or third times and I have reported on them previously. the minutes do not name the public speakers and, in my experience, it is this that is usually the case. That is yet another false statement. The names of public speakers are included in the minutes. I am named, as are a Mrs Speed and Mrs Harris. It appears to me that if council officers are aware of the speaker’s name then it generally goes in the minutes, though there is no consistency. The Committee noted various residents concerns about anti-social driving and behaviour over a period of years. Sergeant Wragg offered to liaise with residents and take action based on information reported. Action Point: Councillors Manning and Moss-Eccardt to liaise concerning implementing An ‘access only’ traffic regulation order in Evergreens to prevent external traffic generated by local school commuters. Tackle unlawful parking and associated anti-social behaviour linked with the Shirley School, East Chesterton plus Evergreens. The reference to “A member of the public” rather than, as was the case, two members of the public, may have confused the Independent Complaints Investigator, though “residents” is mentioned in respect to correspondence with Cllr Nimmo-Smith. She refers in her report to correspondence which I had with one of those from the Evergreens who spoke but fails to make clear if the individual who I corresponded with was the complainant. The presence of this quotation in the report might suggest to some readers that this individual was the complainant and that may well be misleading. Mr A seems to have been able to apply to film all meetings in advance. There is no provision in the protocol for there being more than one request to film. If Mr A has pre- booked all meetings the Chair would either have to accept more than one camera or refuse the newcomer. I think this is a rather bizarre statement. I did make a request to film all meetings in advance that’s true, but it was rejected. I don’t think there’s any way the council can be expected to pre-empt every way someone might seek to poke the beast and apply to do something. I think the suggestion made by the investigator that the council clarifies the position with respect to blanket requests is a good one. The report makes a number of largely quite outlandishly silly suggestions. Unfortunately these will now be considered by councillors so may well need seriously rebutting. To ensure the notice at the entrance to the meeting is large and: advises attendees that consent has been given by Councillors for a private individual to film; that as a result the film may appear on various social network websites and CCC has no control over this; that the public have an absolute right not to be filmed or voice recorded; that any objection should be made to the Chair at the beginning of the proceedings or at any point throughout. Notices are already A4 sized and contain large clear text; multiple notices are used. There is no explanation given explaining why the investigator considers that material filmed by a “private individual” may appear on “various social network websites”. Whoever does the filming it may end up published anywhere online and will not be under the council’s control once it has been published. For the purposes of news reporting and criticism copyright does not apply. That the Chair ask all present and any latecomers if they have seen and understood the ‘Notice’. I think that would be highly disruptive. Clearer explanations, especially at area committees, of what’s going on, who’s present, and what the public speaking rules are would be a good idea. That the Chair adopt the method used by Oxford City Council whose Chair can be heard throughout a recording saying ‘stop filming please’, presumably when someone who has expressed a wish not to be recorded starts to address the meeting. I agree that if filming is to be stopped the chair, or council officers, need to ensure any direction from the chair is followed. I disagree with Corinne Hibbert’s assertion that few public speakers would opt-in to having their contributions recorded. Many public speakers at the last full council groaned with disapproval when the mayor ordered the camera be turned off. Those speaking on behalf of others such as union representatives, students’ representatives might want those they represent to see what they have been doing on their behalf. I don’t think the council should start giving preferential access to certain individuals or organisations, that is a dangerous slippery slope to go down. I think this is clearly bonkers. I can’t see what it would achieve; it would limit those able to publish films of council meetings to those with the technological capability to do it themselves without the help of services such as YouTube or Vimeo. It would mean that one person, or group, could make a video put it online and comment on it, but others would be unable to also present the video and offer a different interpretation and commentary to go with it. I think the question of the purpose of advance applications needs to be made clear first but if councillors want to ban blanket requests then a clause like this appears reasonable. Consideration should be given to the film maker signing a short contract setting out the privacy elements of the protocol. It is already the case that those seeking permission to film council meetings have to give a number of undertakings; no written signature is required. To require applicants to print off and physically sign applications (and presumably submit them by post) would be bizarre; requiring this kind of thing is a method officialdom uses to deter people from doing things. The requirement to seek permission and make the required undertakings in itself ensures those filming meetings are aware of the protocol. Members should give consideration to whether or not it is necessary, or desirable, to film all public meetings. It may be more appropriate to film full council meetings only, as appears to be the case with Oxford City Council. 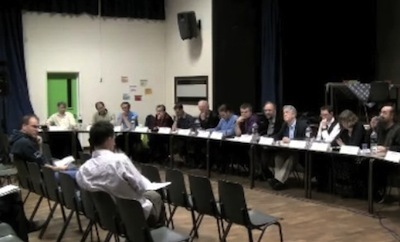 I think filming meetings themselves is a good idea for councillors to consider. As many decisions of most public interest are made at Area Committees, or at Planning and Licensing committees in Cambridge I think it would be better to pick decisions for filming based on anticipated interest levels rather than filming whole meetings, or just full council meetings. Where the council doesn’t record meetings themselves I think others should be able to. That CCC [Cambridge City Council] consider whether their best option is to film themselves. This is obviously a cheaper option if only full council meetings are filmed. However the use of a static camera could be explored as could advice on software that would limit reproduction of any film appearing on CCC’s website. CCC’s website may already have this. Although it would always remain possible to film the webpage this would be poor copy plus it may be possible to protect copyright. Assuming the same protocol rights as now, the main problem would be in stop /starting a static camera. I see no reason why, if CCC are filming, there would be any need to allow anyone else to do so. That would defeat the purpose of being able to control reproduction; protect privacy and safeguard against any potential liability. The investigator believes the only way to get a copy of a video, which has been copy-protected, from a council website would be by aiming a camera at the screen. That would only be remotely conceivable if the council very strictly limited viewing to via particular proprietary software. No explanation is given as to why publication of a public speaker’s speech on the council’s website would be any different from a privacy point of view to publication elsewhere. Having read the rest of the report it is not surprising that the investigator has come up with the sentence: “I see no reason why, if CCC are filming, there would be any need to allow anyone else to do so”. There are of course many reasons. One is timeliness; with major public interest in a decision or debate the media may want to broadcast as soon as possible, or even live, waiting for the council to place video online may create an unacceptable delay. Another reason would be quality; it is probable that any recording by the council may not be of sufficient quality for TV or Radio broadcast. Why film at all ?… Another option may be to record and fully transcribe meetings. I think a full transcript would be much more boring than video. The video is also a much more reliable source, and is more likely to be accurate. I think full automatically generated transcripts might well prove useful for indexing videos (as done by the BBC Democracy Live website). I don’t know if the independent investigator gives her services voluntarily or if she is paid. I would be very concerned if public money was being spent on an investigation which was of this poor a quality. I am writing to confirm the outcome of the investigation of the complaint about the filming at North Area Committee and the issues associated with this. Given the Independent Complaints Investigator’s conclusions, I am lifting the current restrictions against you filming, which were put in place while we considered the complaint. The letter was scanned in and sent to me as images in a PDF; making the text inaccessible for copy and pasting. The Independent Complaints Investigator’s conclusions make no reference at all to me; which is unsurprising as I was not the subject of the investigation, it was the council’s procedures which the investigator was being asked to review. There never was any suggestion I had done anything wrong. No logical explanation for banning just me from filming meetings has been offered. Report into Cambridge City Council’s Protocol on Filming Committee meetings which has been produced by the council’s Independent Complaints Investigator Corinne Hibbert. (PDF) Released 23rd of November 2010. Letter from Cambridge City Council’s Chief Executive Antoinette Jackson Lifting my Filming Ban (PDF) – 23rd of November 2010. This entry was tagged Openness, Transparancy on November 24, 2010 by Richard Taylor. Just read the Filming Protocol letter. It looks like something Joseph Goebbels would have concocted; so many restrictions, so many directives. I don’t really understand why it would be a problem if two people want to film. Is this an issue of space, or is it just more pathological fear of openness? I don’t understand why there can’t be an alternative for people who don’t want to be identifiable on film? If members of the public who didn’t wish to be identified could submit their question by paper (or even by email/text during the meeting!) to be read out by the chair then there would still be the chance to be heard, but also no issues with filming stopping and starting. I also find the restriction on limiting the footage to the film-maker’s own website baffling. Few people have the ability to upload video other than via sites such as Youtube etc. This would restrict the type of person who is able to film a meeting. I’m assuming if published on the web only on the film-maker’s website, searching using the right terms will make you just as likely to find that video as if it was published on Youtube etc. I find this particular suggestion completely baffling. Thanks for another hilarious article on this subject. It’s good to hear that in future you will be allowed to press the stop/start button on your camera instead of having to get Andrew Bower to do it. Often when you commission a report you get the answer you asked for. I wonder who asked for this report, and what they asked for it to say? Richard, Thank you for pushing our council one step closer toward openness and accountability. Your articles on rtaylor.co.uk are a very important resource for Cambridge democracy, and we’d be in a much sorrier place without your tenacity and patience. Surely the best thing would be for the Council to do its own filming and post the entire record on the Council website.Then there would be no need for members of the public to get involved or compete for space. I am pleased to learn that Andrew Bower can be trusted to press a button. The only problem with the Council doing it’s own filming is that it will be *expensive*. If Richard records a meeting the costs are – fundamentally – met by Richard. If the Council records something then the whole debate about rules, formats, hosting, archiving, management, cameraman/ sound recorder/ editor/ publisher wages, etc have to be had and once the Council has agreed something then these issues will need to be continually reviewed. Managing everything related to filming meetings could quite easily turn into someones full-time job. And after all this has been agreed and debated and the first few recordings have hit the web someone will say “is it worth it?” when they look at the small number of hits a video of a Council meeting will get on YouTube! In short a member of the public feeling passionately enough to record the meeting with the Council providing a fair set of rules to govern how the reporting is done and what can be done with it (i.e. the full version must be made available rather than “edited highlights”) is by far the best way forward. The debate, it seems to me, is about the formation of that “fair set of rules”! I’m not sure if Cllr Pellew is getting his “ie.” mixed up with “eg.” but if he meant to suggest that a full version of a meeting is all that people ought be permitted to distribute I disagree. This would mean in many cases many hours of video would be needed to show all the deliberations on a particular decision. The CB1 planning meeting for example took two days, many deliberations take many hours. Very long videos are not going to make the council’s deliberations much more accessible, and the potential of putting video online will be lost. News organisations such as local radio and TV aren’t going to cover council meetings if the council forbids them from putting a selected few seconds of highlights on their news programmes. A 14 second video clip of Julian Huppert speaking in Parliament last week has had over 1500 views. I suspect that is many times more people than will have watched the entire speech, less will have watched the entire debate, and I doubt there’s anyone who watched the full day’s parliamentary session. The problem with silly rules such as forbidding the distribution of highlights of council deliberations is that those breaching them might find themselves forbidden from filming at meetings. The council doesn’t always step in to stop people who have film or recorded council meetings without permission (In the case of the animal rights protesters seeking a ban on Foie gras they were quite blatant; but I suspect councillors and officers were unwilling to confront the mob) . Perhaps the way forward is for more people to just go in and film from the public gallery / public seating. I’ve tried taking a photo without permission (before I knew the rules) and was tackled by the Sergeant at Mace. Chairs can throw disruptive people out of their meetings; and they might well claim filming was disruptive – though of course what would actually be disruptive would be councilor’s objections to it. At least we’re not in Westminster where the council have imposed huge restrictions on filming on public spaces in the Westminister City Council area. Cambridge City Councillors are only getting above themselves in their own meetings. Didn’t put that very well – the whole meeting should be made available so that remarks can be seen in context. However providing the whole meeting is made available then I’m happy for snippets to be used elsewhere which people can use to illustrate specific points with a reference back to the source material. What I’m not happy for is *only* the edited highlights selected by the film maker to be made available. Hope that’s cleared up my point from earlier! Cllr Pellew, that is still quite a burden on the person doing the filming when you consider the amount of mobile storage required, battery life requirements, server space, network bandwith and transcoding/rescaling time. What if they inadvertently are unable to record the whole meeting, are they then forbidden from publishing any of it? In any case, I think you are seeing this from the wrong end. You are attempting to ask the question “what is of most utility to the public” rather than “should the public have the general right to make a record of public decision making?” I don’t think, like Cllr Marchant-Daisley, that this is a question of balance: it is a question of principle. I do think it is odd that Richard has been denied permission to record audio only. Such recordings would be much easier to store and manipulate and would capture the critical aspect of the meeting. I wouldn’t mind filming being banned so much if audio recordings were permitted along with copies of any materials projected or distributed at the meeting. The council has potentially been very foolish in denying Richard the right to record a meeting which they gave me permission to record. Their procedures must be even-handed and transparent to be beyond reproach. I gave similar undertakings when I made my application, making clear that I intended to put the recording in the public domain. Incidentally, the council failed to put notices up outside the meeting I recorded despite recording having been agreed in advance. Yes, I agree it’s a massive burden on the person doing the filming (just to add that by “available” I do just mean available not necessarily online). In my view though this would at least give members of the public (or Councillors?) who feel they have been misrepresented an avenue for response. You have to be very trusting of the journalist (citizen or otherwise) doing the filming to give them an absolute free reign to edit and use the film in any way they like. Whilst, as Councillors, we are to some extent at the mercy of journalists it’s a little much to expect members of the public who want to raise points at public meetings to inflict this level of scrutiny on themselves! The point of public meetings is for the public to turn up and get involved. “What is of most use to the public” is, in my view, the right question. The principle is access to the process, not a video recording of it. I agree that a rule banning Audio recordings but allowing video makes very little sense. Copies of all materials available at the meeting should be available on the City or Counties website – my understanding is that this is the case currently. What meeting (and what notes) are you thinking of? While I can’t see that Andrew Bower has mentioned it in his comment – getting copies of all documents tabled at meetings available online is something I have been pushing for, and the City Council has been getting better at it. Cllr Pellew – there was at last night’s North Area Committee (which you attended and sat in silence throughout) an “Actions Sheet” referred to by the chair, which there were not adequate copies of for members of the public (I didn’t get one) and isn’t online. There are cases like this at almost every meeting. That said the City Council is generally excellent at getting agendas and reports online (though it failed with the last licensing committee [which may have been cancelled?]). I think it is absolutely astonishing that a Liberal Democrat councillor would not want to give journalists a free reign to edit footage of a council meeting. The alternative is something the professional media are quite rightly very wary to get in to as it leaves open the potential for censorship and manipulation. There are laws against defamation, I cannot see any need for Cambridge City Council to try and gold-plate those. Requiring those making videos to hold onto a copy of the whole unedited recording indefinitely is a huge burden on those making recordings. While this is required by the city council it is something both I and Mr Bower refused to accept; our declarations both limited ourselves to making full unedited footage available so-long as we had it. To pre-empt such a request – in all cases I have posted whole meetings; or at least whole items, on Youtube / Vimeo, sometimes with selected excerpts too. I am aware Mr Bower posted all the footage he captured to Vimeo. If you look at many university and scientific bodies who do put whole days of conferences and meetings online I would say the idea of putting the whole meeting online is a completely valid one. Editing is important, but the ability for people to see the context in which is was said is important as well. Having the whole meeting online and say you having one clip on here or YouTube and say what the time code is is the answer I would say is sensible. Many university rooms are kitted out for recording meetings; however one problem is the university are notoriously (scurrilously in my view) reluctant to allow the council to use their facilities. (They do things like insist on only hiring rooms when they can provide, and charge for catering, for example). The University of Cambridge doesn’t have much of a public service ethos despite receiving substantial public funds. I think Cllr Pellew really has missed the point. If the city council were recording the meeting then of course they should be required to make it all available but that is totally unreasonable for members of the public, interest groups and journalists. I didn’t quite put the whole sequence on ‘vimeo’ because I didn’t concatenate the two video files that Richard’s camera emitted, although I did make available a downscaled version of the last few minutes on my blog post as a file to be downloaded. This just goes to show how unreasonable it is to expect what Cllr Pellew wants, even just to retain in case of a request. It is ridiculous what Pellow is demanding. And he works in IT so he ought to know that it is ridiculous. The next thing these Lib Dems will be demanding is that anyone who comments on a public meeting will have to provide a complete transcript. I’m in no way suggesting that you (or anyone else) be responsible for holding onto the video in perpetuity! Your point on the laws surrounding defamation is well made and that’s a really interesting point to have a debate on. wab > I’m an opposition County Councillor so in absolutely no position to “demand” anyone does anything. What I’d like to see is a reasonable discussion where everyone gets to put their point of view. Slight confusion; I assumed you were saying that I thought you should hold onto the raw video for ever. I honestly had no idea it was a requirement from the City Council as I’ve had no involvement in that process! Given the size of video files and the number of meetings I agree with you that it does appear to be unreasonable to make members of the public hold onto video recordings indefinitely. A few weeks would seem reasonable and I was viewing that as a “burden”! The nearest analogy I can think of what I’m looking for is the recording of Oral Questions at the County Council. The actual recording of these sessions are used to produce the minutes and then kept “for a while” (in case the minutes are challenged) before being deleted. I see that the Council have revised their protocol, but it still seems determined to discourage the practice. Why is panning of the camera not permitted, it’s like making horses wear blinkers to restrict their vision. A lack of vision from the Council indeed! Firstly the press and Richard get the same access to meetings. Certainly Richard definitely gets the same deal at Shire Hall. I’m not so clear about what would happen if another less-well-known blogger turned up. I’m also intrigued that Richard was turfed out of some seats that other people were allowed to use at later meetings. Secondly, I don’t think Richard would want the same deal as the press in other ways with unattributable briefings and embargoed material but I could be wrong. Richard? At the county council it appears the professional press and I get the same access. In practice at the last meeting I got better access because I’d asked permission to film in advance so was allowed to film the meeting in progress, not just establishing shots at the start. I am very anti taking advantage of any special access. I would like to see the County Council allow anyone who wants to sit on the seats behind the councillors, or stand at the back of the chamber, or if there’s space use one of the press/officer desks. At the City Council I certainly don’t get the same deal as the press; the big advantage of getting to use the press desk for me would be a power socket, letting me take notes on my laptop (and live tweet) throughout a very long meeting. I’ve not tried this. At the City Council despite many meetings now being attended by staff from both Cambridge First as well as the Cambridge News there is only one press seat and desk at most committee meetings. At full council there is one table with only really room for two people. At the City Council who’re not professional press, members’ guests, honorary councillors, petitioners or questioners are not permitted to sit behind the councillors at City Council meetings. On occasion the mayor has stopped the meeting to ensure that petitioners / questioners are sent up to the gallery after they’ve said their piece – but the council’s behaviour on that is inconsistent and appears to depend a lot on if the questioner is friendly to the ruling Liberal Democrats. I’ve certainly been told to go up to the gallery after asking a public question. That’s not much of a problem at the City Council as its possible to hear what’s going on clearly from the gallery, and generally papers, including amendments are brought up. It’s much harder to follow along from the county council gallery, and no papers are delivered up there. Liberal Democrat Cllr Clare Blair at the North Area committee has said: “You’re not press” when I questioned what had just happened at one point during a meeting. (Councillors had nodded something through, and I was unsure if they’d agreed to so something or if the item had fizzled out and they’d moved on). Based on that I think there would be objections if I did try and use a desk / power socket in the city council chamber. I don’t think councils ought distinguish between the press and public. The press do have some legal rights that the public don’t. The public doesn’t have a right to access all papers discussed – the press do. I’ve been lobbying the City Council to get them to publish papers tabled at meetings as a matter of course but this does not routinely happen. (A campaign of FOI’ing for them might prompt a change?) The press also have to be given access to a telephone (this can be a pay phone). These laws clearly need updating. At the County Council I’ve been given internet access; at the City Council there is wi-fi, (which appears to be set up to cope with “guest” access for events, but the public are not given access to it during council meetings. Updating the law to require perhaps public access to Wi-fi where available and certainly the online publication of all meeting papers rather than simply making them available to the press would be logical steps to bring the door up to date. As for unattributable briefings and embargoed material – I do speak to all sorts of people all the time. I think that officer briefings to councillors ought be open to all who are interested, as happens elsewhere. I see that the Council has published the updated filming protocol and filming application form. I haven’t analysed the changes, but I’m sure you will! The panning and zooming ban previously imposed by chairs has now been formalised and incorporated into the protocol. The protocol applies to specific named meetings; it appears filming is therefore completely forbidden at others. A blanket request to film all meetings is not permitted, individual requests need to be made shortly before specific meetings. No changes have been made which, in my view, would have affected the circumstances leading to the complaint. The changes are all restrictive, and are anti-transparency and make things harder for those wishing to make what the council is doing more accessible or to comment and report on it. The Council have just published their Constitution, which includes an appendix F ‘Protocol on media relations and filming, recording and photography at council meetings’.